The Westchester County Department of Health was established in December 1929 with the adoption of the state public health law. Its first annual report details its activities with regard to communicable diseases, sanitation, and public health nursing, among other things. In 1973, the entire population of the county came under its jurisdiction with the addition of the separate health districts in the cities of New Rochelle, Mount Vernon, White Plains and Yonkers. 9 cubic ft. Arranged chronologically for subseries 1 and 2; alphabetically for subseries 3 and 4. View finding aid or box and folder list. With the passage of New York State Public Health Law 20-b in 1929, counties in New York State were to receive state aid for establishing health districts. On December 23, 1929, the Westchester County Board of Supervisors passed a resolution to establish the Westchester County Health District, and all village and town boards of health were abolished.The Westchester County Board of Health held its first meeting on January 7, 1930. In early years, meetings addressed administrative matters such as appointments, staffing and budgets. Later meetings saw the enactment of resolutions, regulations, adoption of codes, and dealt with various public health issues.Two major codes were passed during the years covered by this collection. At the April 7, 1932 meeting, the Board of Health passed the Westchester County Sanitary Code, which set standards for the enforcement of the state sanitary code in the County. On July 12, 1979, “Article 20: Anti-Smoking-Clean Indoor Air,” was adopted. The Westchester County Board of Health collection covers the years 1929 through 1991 and consists of four subseries: Original Minutes, Minutes and Background Materials, Administrative Records, and Anti-Smoking Code.The collection documents the efforts of the Board of Health and the Westchester County Department of Health to develop effective policies and enforce health laws and regulations.Subjects and topics in this series include preventive care, population health issues such as community health, child health, infant mortality, epidemics, diseases and morbidity, animal control, sexually transmitted diseases, vaccinations, food hygiene, mental health, air pollution, health education, smoking, legal rulings, building standards, and nursing and hospital programs. Types of materials found in this collection include minutes and agendas, narrative reports, budget reports, resolutions, correspondence, letters, petitions, legal opinions, newspaper articles, a small number of photographs, and hearings reports on violations of the Westchester County Sanitary Code. See complete series description for more detailed information. 9.5 cubic ft. Arranged alphabetically. View box and folder list. Administrative and informational records of the Community Health Education and Information office of the Westchester County Department of Health. The files highlight community relations activities and document efforts to inform and educate the public about health issues and topics, as well as health services and health care available in Westchester County. The records also demonstrate the participation of staff of the Westchester County Health Department in health education programs in the county, New York State, and at educational and religious institutions. The bulk of the records date from the late 1960s through 1981 and were primarily created and maintained during the administration of Winifred Steed, director of the Office of Health Education and Information, and her staff. Folders with earlier dates were generally maintained for background research on projects. The Archives received these records with no discernible arrangement; they have been organized here in alphabetical order. Materials found in the collection include memoranda, letters, booklets and pamphlets, brochures, conference proceedings and handouts, computer data control sheets, newspaper clippings, news releases, newsletters, and photographs. A significant number of newspaper clippings were obtained from local clipping services; operational files such as budget records are included as well as records that monitored the operations and functions of County healthcare facilities such asdental clinicsand mobile dental vans and neighborhood health centers. 7.15 cubic ft. Arranged by subject. View box and folder list. Materials created and maintained by the Health Department’s Division of Public Health Education and Information regarding numerous public health topics. Materials are arranged either by specific disease / subject, or by broader category, such as Reports/Publications and Educational Materials. Particularly well documented are the Health Department’s activities in response to the outbreak of West Nile virus beginning in 1999 and 2000, with extensive amounts of press releases, news articles, educational flyers, pesticide spraying schedules, as well as a generic draft environmental impact statement for the pesticides being sprayed. Also well documented are activities related to HIV/AIDS, with the records of the County’s AIDS Council from 1994-2004, and Lyme disease. Many of the meeting materials distributed for all three of these subseries – West Nile virus, AIDS, and Lyme disease – contain articles on current studies (at the time) about the diseases, their causes, treatments, and impact on public health. Other topics covered by this collection include conditions of public beaches in the county, documented by news articles, press releases, and alert notices regarding beach closures due to high bacteria counts or sewage discharges; disease outbreaks such as Rubella in late 1997 / early 1998 among immigrant populations and the educational flyers used to encourage treatment for and immunization against the disease; and efforts to enact anti-smoking legislation and the Health Department’s stance on the same. 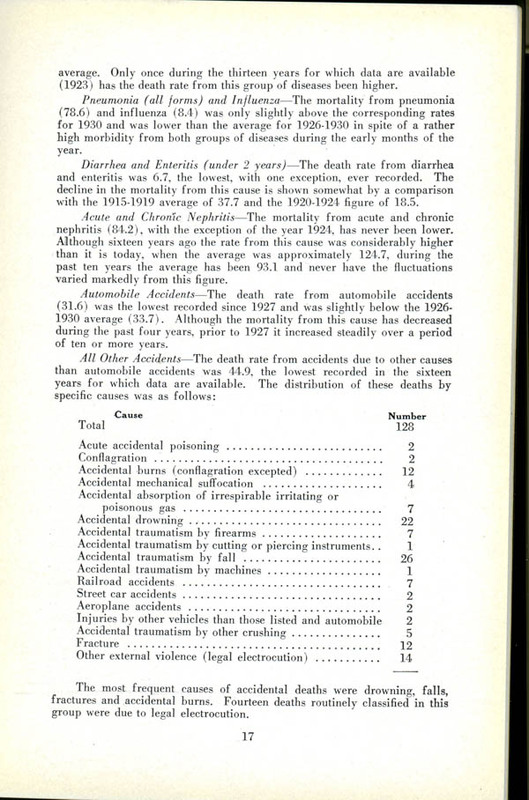 Finally, a wide range of subjects from health disparities among African-American in Westchester County, rabies alerts, testing for lead paint, conferences on gerontology, and the importance of hand washing are covered by the numerous publications, reports, and educational materials included in the collection. See the finding aid for a complete list of topics covered. Annual reports created by the Division of Environmental Sanitation of the Westchester County Department of Health. The reports contain information concerning the department’s investigations, actions and preventions concerning the environment of Westchester County. This included sewage treatment, the public water supply, and air pollution. The reports also investigated milk pasteurizing plants, organizations that handled food, mosquito detection, and animal bites; various charts and tables are included in the reports. There are notes, drafts, and memorandums concerning the reports that accompany various copies of the actual reports. An evaluation of the 1962 report by the New York State Department of Health is included. Less than 1 cubic ft.
Thesis by New York University Master's candidate Henry L. Nelson. The thesis, entitled An Investigation of the Pollution of Bathing Beach Waters at Kingsland Point Park, NY, dealt with the outflow of sewage on the beach and the subsequent levels of e-coli. Narrative and statistical reports documenting the monthly activities of the Health Department's Division of Environmental Sanitation, which in 1969 became the Division of Environmental Health Services. Records include narrative monthly reports from the entire division as well as section narratives, statistics, calendar for the divisional head and supporting documentation. The narrative division report consistently deals with the following topics: water and public sanitation, quality of milk and milk products sold in Westchester, quality of food and food handling, animal complaints, miscellaneous complaints, radiological technology, air quality, and Con Edison's Indian Point facility. 1.16 cubic ft. Arranged chronologically in two subseries. View box and folder list. Annual and statistical reports created by the Health Department of Westchester County. The annual reports begin with health events of the past year, followed by more detailed descriptions of data; some tables and charts are included. The data progresses from the general with the population of Westchester for that year, to the number of births, deaths, and people who contracted or died of disease and other abnormalities or accidents. A mental health report is also included. Information pertaining to the division of public nursing (number of registered nurses working in Westchester, activities and meetings that have taken place, and those studying to be nurses currently working in Westchester) and data on the environment and sanitation are also included in the reports. 2.33 cubic ft. Arranged chronologically. Press releases issued by the Westchester County Department of Health. Some of the topics covered by this collection include: rabid animal alerts; immunization recommendations; extreme weather alerts; advisements on specific disease prevention and outbreaks such as influenza, E coli, Listeria, Legionnaires, cancer, and HIV and AIDS; food safety tips and reports on the inspections of food establishments; beach closing announcements; and sewage discharge and boil water alerts. Beginning in 2000 an extensive number of releases, particularly during the months of August and September, deal with outbreaks of West Nile virus. For the years 2004-2006, there are also some newspaper articles, based on the press releases or which formed the basis for later press releases, included in the files. Less than 1 cubic ft. Arranged chronologically in three subseries. View box and folder list. Bound volumes of the Westchester County Department of Health newsletter (1930-1941); two issues of “Health News”, the New York State Department of Health newsletter for January 1930 and May 1941; and a 25th anniversary report on the health of Westchester published in 1955. The weekly Department of Health newsletters primarily contain information concerning health in Westchester and health and medicine in general. Statistical information is included such as number of cases, age groups, and deaths, and clinic schedules for patients suffering from diseases such as cancer and tuberculosis. 8 v. and 1 folder. Arranged chronologically. View finding aid or box and folder list. Covers adoption of the first sanitary code for the Village and City of Mount Vernon subsequent additions and amendments, issues associated with the transition to a public sewer system, food inspection rules and procedures; and contagious disease/epidemic control practices (i.e. public vaccination, public education, medical supervision, quarantine guidelines, etc.) for smallpox, cholera, typhus, typhoid, scarlet fever, influenza (including 1918 pandemic) and diphtheria. The minutes also contain discussions and laboratory reports related to the maintenance of a sanitary water supply and a record of many complaints about unsanitary conditions submitted to the Board and investigated by the Health Officer. The collection also contains minutes of the Mount Vernon City Laboratory Board of Managers. The laboratory was established in 1939 and provided bacteriological and serological services, facilities for disease control, and milk and food examinations. A separate folder contains information on Mount Vernon’s tuberculosis control project, including narrative reports, budget documentation, testing reports, correspondence and pamphlets. Related Records: Annual Reports for 1966, 1967 and 1968 for the Mount Vernon Department of Health are located in Series 200, Government Publications collection. Annual reports created by the Health Department of the City of New Rochelle prior to its merger with the Westchester County Health Department in 1973. The report begins with an overview of the health events of the past year, followed by more detailed descriptions of data; some tables and charts are included. The data progresses from the general, such as statistics on the population of New Rochelle according to the previous census, to the more specific, such as the number of births, the number of people who contracted or died of disease, and the number of murders and suicides. Also includes data on number of reported doctor visits, dental visits, complaints of health and sanitation, and permits for businesses relating to food and health. Narrative and statistical reports describing the various sewage disposal facilities in use in the early 1930s and those being built. Also mentioned are plans for the riddance of pollution on shores, beaches, and river beds. The reports include drawings of facilities, photographs of construction, maps, and charts.